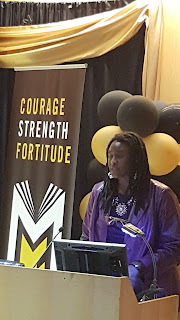 Ambassador Robin Renee Sanders, as CEO-FEEEDS. in discussion with President Obama during a recent dinner where the President Discussed his Agenda for 2016. 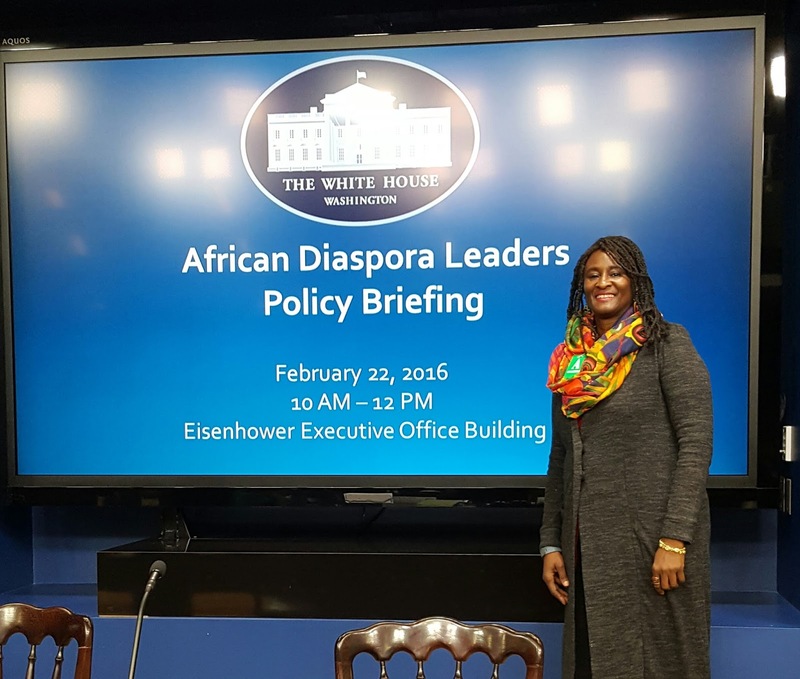 As part of both African American History Month and International Women's Month, Ambassador Sanders, CEO-FEEEDS Advocacy Initiative, was invited to participated in a series of substantive briefings for Africa Diaspora-focused organizations, like FEEEDS, to hear updates about both White House specific initiative under President Obama's leadership such as my Brother's Keeper activities and work around the U.S., the President's upcoming US-Africa CEO Forum in September 2016, and work on US-Africa Trade. In addition there were briefings by USAID on Africa programs, and opportunities in which US-based Africa small and medium size businesses and non-government organizations can become partners and/or implementers. 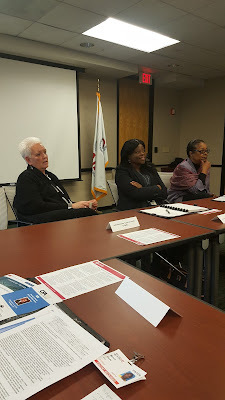 The USAID meeting was led by the Agency's new Administrator, Gayle Smith (with whom Dr. Sanders worked with during her White House days), her most senior deputies on the Africa Region, along with Directors for key offices from procurement to public engagement, and outreach. The Africa Diaspora organizations attending the USAID briefing were convened under the auspices of the Constituency for Africa, one of the leading U.S.-based organizations focused on Africa. Here are a few pics from the series of briefings. Sister Cities International (SCI), founded by President Dwight Eisenhower in 1956, was created because the late president believed in the importance of citizen-diplomacy and connecting people from all around the global to better understand and work together. Every year since its founding, SCI has played a critical role in building bridges among and between people of the United States and other countries. It was a SCI program in Lincoln, Nebraska, that current Chinese President Xi Jingping, remembered fondly about his time in the U.S. as a young student. So much so that it was back to Lincoln he went for a short visit to spend time with his former "host family," after his State Visit to the United States with President Obama in September 2015. In addition every year SCI recognizes leaders and activists on key issues from around the world. 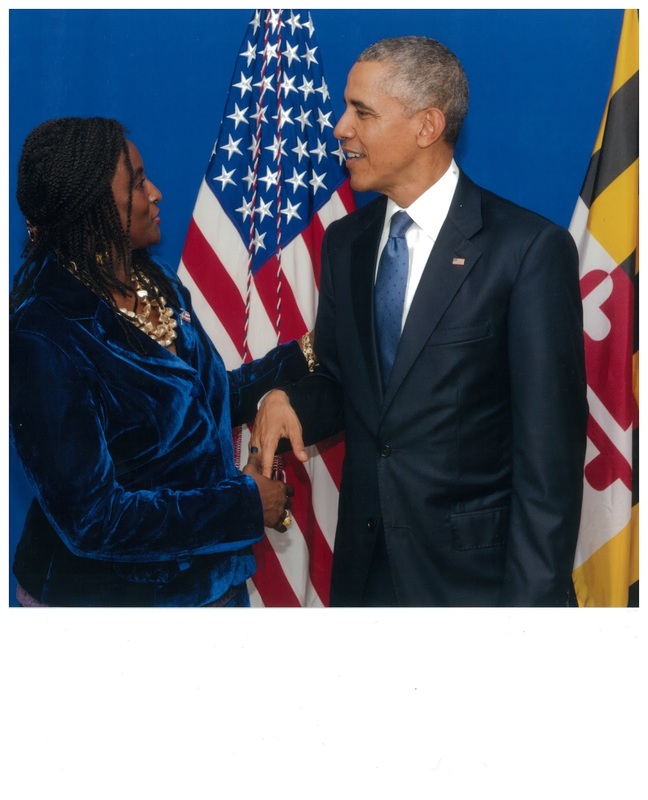 This year it presented its "2016 Diplomatic Leader Award," to Ambassador Robin Renee Sanders for her past public policy work as a career United States Diplomat, and her current work with African communities, advocacy efforts on such global issues as human rights, women empowerment, support for Africa Diaspora small and medium size enterprises, and global sustainable development issues under her FEEEDS Advocacy Initiative. 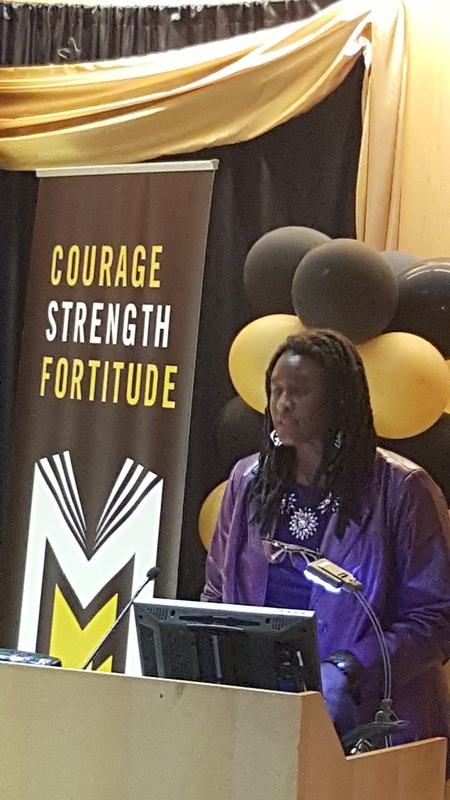 The award was presented to Dr. Sanders, by SCI President Mary D. Kane, and SCI Board member Dr. Christine Warnke at SCI's 2016 International Women's Day event March 8, 2016. In her remarks upon receiving the award, Ambassador Sanders noted how much she admired the strategic-thoughtfulness of the late President Eisenhower as he is responsible for many of the U.S. organizations and U.S. Government structures, particularly those within the U.S. Defense Industrial Complex today, as well as being a leading force behind the creation of the previously called Industrial College of the Armed Forces (ICAF), which was renamed after the late president in 2011. Dr. Sanders added that she served, while a career U.S. Diplomat, as the Deputy Commander of ICAF as well as taught national security and African studies and that Eisenhower's foresight in understanding the importance of the U.S. matching resources-with capability-with strategic thinking is something she gleaned from her time at ICAF, along with from reading many of his papers. In addition, Sanders added, Eisenhower creating a wonderful institution such as SCI further demonstrates how remarkable his vision for the future was and how important it was to him that all of us do whatever was necessary to ensure that the world remained peaceful. Organization like SCI has really lived up to his vision and his expectation, the Ambassador noted in closing. Good morning. I am delighted to be here today, and in particular this week on the dawn of celebrating this year's International Women's Day, which was March 8. The theme the United Nations had given to International Women's Day this year was – "Planet 50:50 by 2030" -- meaning global positives for women and girls should be on the same footing as they are for males by the year 2030. This "2030" date is going to feature a lot in my remarks today because it also the seminal date agreed to at last year's UN Session by 197 world leaders, including President Obama, to achieve these "five" main global Sustainable Development Goals, or SDG's. Why should "helping' be important to us given the range of issues we face here at home– such as black lives matter, poverty in many communities – be they Black, Latino, White (proportionally more so for the former two); a fractured criminal justice system, and are own economic challenges right here in America. -- So let’ start with answering these questions – why is this region of the world important, and what does this region mean for and to the United States of America as a strategic political, economic, investment and cultural partner. In other words: What are the elements of the US-Africa relationship? These are the basket of demographic elements that require the U.S. to see Africa today as an important Region to engage with properly and to cultivate positive partnerships. Taking a closer looks at the specific figures here are some to help put the basket of Africa's demographics into perspective as to the …. what, … the why, …. and the good news and the challenges as regards to the 48 countries in the Sub-Saharan Region. -- Africa’s population today is reportedly 1.1 billion people and it is on course to reach 2.4 billion people by 2050. Its current average yearly growth rate is 2.45 per cent, which will likely be higher than that over the next decades. --The most significant sub-figure, in the Continent-wide population numbers I just cited, is the figure on youth/young people (ages 10-34), representing about 50 percent (or 600 million people). This figure will continue to grow over the next two decades. I am emphasizing this sub-figure because I see it as Africa's "population dividend." Meaning for me it is a positive (but of course it has the potential to be problematic if certain development issues are not addressed more). These population stats will move Africa, in the next decade, from the third most populated region in the world to the largest. But, most of its people, particularly women and girls, could remain below the poverty or extreme poverty level if current development efforts do not triple between now and that seminal date of "2030," where both the parity effort (Planet 50:50) in support of women/girls, and the five main Sustainable Development Goals (SDG's), I mentioned earlier are supposed to dove tail. So what are these "Five Key SDG's" (with their 167 targets) all about and where do women and girls fit in and what are their needs. I am sure you can guess many of them, but I do want to give you the current context. I was a delegate at the 2015 United Nations session, and participated in discussions on the roadmap for the success of the SDG's over the next 15 years to further cut the pillars of extreme poverty. Keep that term in mind – the focus is on extreme poverty, so it is unclear to me if a distinction is being made between "extreme poverty" and "poverty," but if you have travel around the United States and overseas, as I have, and probably many of you, extreme poverty and/or poverty are relative terms for people struggling every day to have affordable, adequate shelter and access to health care, feed their children and provide them with an education, have potable water to drink, and fundamentally feel and be safe in their living environments. 1.) Leave No One Behind. No person – regardless of ethnicity, gender, geography, disability, race or other status, should be denied basic economic opportunities and human rights. 5.) Forge New Global Partnerships - Shared humanity, mutual respect, inclusion (especially for poor & at-risk people (e.g. women, youth, aged, disabled persons & indigenous people). New global partners include expanding outreach to civil society organizations, multilateral institutions, local and national governments, scientific, academic, business communities & philanthropic persons or organizations. With these new pillars from my perspective there was a realization that for women/girls more needed to be done to address their specific challenges and also more need to be done in turn for regions like Africa and South East Asia – home to some of the world's most serve human index indicators. -- A new emphasis on how conflicts and natural disasters affect women/girls more. -- Women are the majority out of the financial/economic sector – estimates are this represents about 1 billion women. -- Global figure of girls out of school is about 121 million, 60 % of that figure is in SSAfrica. And, many countries still do not consistently implement gender-focus education efforts, although policies might be in place. -- Living Wage - Most of the world’s poor make 1-2 dollars a day, and women most often make less. So in sum: Women/girls in the world are the most at-risk, least educated, most affect by conflict, makeup the greatest refugee, migrants & IDP's, have the least access to education, and have the least access to financial literacy and jobs. Turning to Africa here, here are some of the specifics stats that will put these extreme poverty issues into perspective and why the SDG are important for this region and its challenging human index indicators. -- 75 million – current number of young Africans looking for work now, out of the 1.2 billion working age population world-wide looking for work; Unemployment is also a world-wide youth issue. -- 3 per cent – number of African adults with credit cards; only a quarter of young African Adults have accounts at a formal financial institution. -- 736 million – represents the number of mobile phones in Africa of which Nigeria has 100 million. Africa is the most mobile-ly connected region in the world. -- Last but not least, the region has collectively and potentially a $50 trillion[iii] dollar economy – making it one of the largest potential markets for U.S. goods, services, investment, trade, and business relationships. -- In addition, today there are key Africa nations that see the U.S. in a positive light, particularly key economic and political powerhouse leader nations such as South Africa, Nigeria, Ghana, Tanzania, Botswana, Kenya, Rwanda, Mozambique, and many others. -- Africa is the new frontier now for building a stronger and better relationship and helping African communities on many of the poverty and human indicator issues can and should be important elements of our geo-politics, diplomacy, counter-terrorism, emerging markets, cultural exchanges, and building new partnerships. -- Thus, the U.S. leadership is now focusing more on the region in a way that it never did before – comprehensively and strategically but most importantly in partnership. Actions and steps over the last 10 years - in my estimation – have truly laid a better foundation for the positive footing between the U.S. and Africa Today. -- Today we have a range of U.S. programs, strategic partnerships, and educational program, economic and investment relationships laying the foundation for greater and more comprehensive relations, which are helping to address the extreme poverty issues on the Continent on one hand, and supporting the positives I noted above, which are also going on in the Region. -- We have a range of new, innovative, and creative economic development programs (Global Development Lab to help SMEs and entrepreneurs), education (Young African Leaders Initiative), food security (FEED the Future) and health initiatives (PEPFAR for HIV/AIDS, Malaria Initiative, and Post Ebola efforts to create an African-Center for Disease Control) as part of our contribution to helping to address the SDG issues for the Continent, with a particular emphasis on women and girls. -- As many of you know President Obama hosted in summer 2014 the first-ever U.S. Africa Summit (never done by any U.S. President, sitting or otherwise), inviting all the African heads of State to the United States for a comprehensive forum to discuss democracy, economic, human rights, and investment issues. He will also hold another business summit with African nations on September 19, 2016 on the margins of the upcoming United Nations session. -- So what are the next steps? How do we expand the elements highlighted above and build on the current US-Africa relationship to secure a positive relationship with Africa’s large "basket of demographics," particularly since half of the Continent will be under the age of 35 – in prime education years, prime wage-earning years, prime years to be influenced by new partners. -- Given that Africa has this growing "population dividend" that I described above, we have a role to ensure as much of a "quality of life level playing field" on helping to address these SDG's issues for the Continent. -- Rest assured I am not diminishing the need for us to address our own domestic issues of extreme poverty right here at home (which, includes things from inadequate healthcare-to-unemployment-to-education-to-food security and affordable housing). And, I would argue we probably need to have a similar SDG-like initiative focused just on our domestic poverty challenges, but unfortunately that is not the case right now. 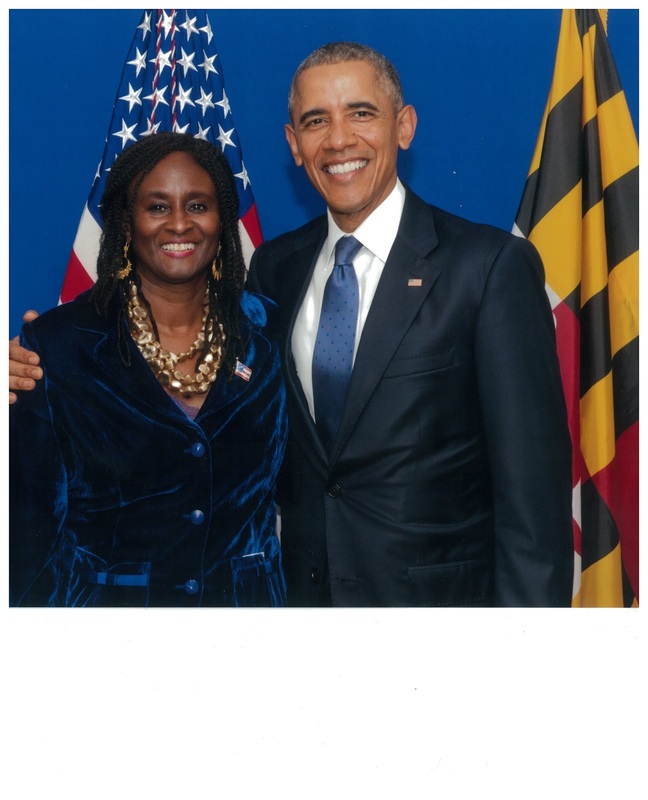 · Note that how the U.S. is viewed is connected to the assistance we provide to Africa's on its development issues. · Ensure that the next generation of young Africans sees the U.S. as a friend even if differences may arise on some policy points from time-to-time. 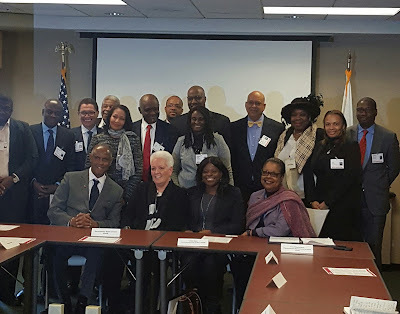 · Remember that there are 1.6 million Africans in the Diaspora here in the United States, who are here because they connect in some way to our values but are still very much connected back home. Thus, this is my list of "why" it is importance for the U.S.to focus on assisting Africa, particularly at the community-level. -- However, we need to understand and respect Africa's (and other region) human cultural differences and their “new global think” on issues. We have to keep in mind it is a two-way street --meaning we need to listen better to Africa's perspectives in times of policy disagreement and on how best to help their communities, and recognize that each country may have its own path to further solidifying its own democracy. -- We can seek to share our values and principles without appearing heavy-handed, and unconcerned about the plight that everyday people face with the searing demographics I just mentioned. -- [Then One of my biggest issues is] Expanding the number of Small and Medium Size Enterprises (SMEs) as this will help build the Continent’s middle class from its current 90 million, and increase the number of SMEs from the current 331 million. -- We all have heard that there are 28 million SMEs in the US, which help make up our middle class and are the backbone of our society; for Africa that role for SMEs would be no different. -- Neither the United States, nor any other country, is going to be able to provide enough formal jobs for the large number of African youth looking for jobs – remember I said the current figure is 74 million today, with 10 million more people added to that figure every year, so SMEs, entrepreneurs, and vocational training are going to be key. -- I believe strongly that having a living wage through being an entrepreneur or owning a SME, or having a vocational skill is fundamental to changing these SDG's for the Region. When one is able to securely provide for one’s self and/or one's family—this changes the trajectory of a life and of a nation. Remember this will be 600 million young people in the 10-34 years age group over the next several decades. -- In sum, as we in the United States lean forward on these challenges I have highlighted, or look out ahead… at the "basket of Africa's demographics" and the "array of today’s geo-political issues," we need to ensure that Africa continues to move up on our list of key places to be fully engaged at all levels. 2. Think about the strategic long term with these emerging African nations, its leaders, and its people, particularly its young people; this also applies locally. As you look at your communities and what long term strategic planning you would/could do? 4. Think about History - Draw on lessons learned from history in the process [of doing 1, 2, and 3]. 5. Think about the SDG framework for our challenges here in the U.S. We have these same challenges and maybe some of the examples and initiatives noted here are useful to those of you focused on domestic communities and our national next step. -- live in a country with political transparency, a free press and good governance within recognized legal and regulatory frameworks, have strong domestic institutions; and, have a reduction/elimination in corruption. [iii] UN Week 2014, McKinsey Session on Nigeria, Remarks by Director Richard Dobbs, New York Palace Hotel, N.Y.